The political push for the colonies to increase cooperation began in the French and Indian Wars in the mid 1750s. The American Revolution in response to lack of elected representation in the British government and a rejection of the resulting law and regulation, followed by the beginning of the American Revolutionary War in 1775 and a proclamation by the monarchy that Congress were traitors in rebellion, induced the various states to cooperate in seceding from the British Empire. Starting 1775, the Second Continental Congress acted as the provisional national government that ran the war. Congress presented the Articles for enactment by the states in 1777, while prosecuting the American Revolutionary War. 1. Establishes the name of the confederation as "The United States of America." 2. Asserts the equality of the separate states with the confederation government, i.e. "Each state retains its sovereignty, freedom, and independence, and every power, jurisdiction, and right, which is not by this Confederation expressly delegated." 3. Establishes the United States as a new nation, a sovereign union of sovereign states, united ". . . for their common defense, the security of their liberties, and their mutual and general welfare, binding themselves to assist each other, against all force offered to, or attacks made upon them . . . ," while declaring that the union is "perpetual," and can only be altered by approval of Congress with ratification by all the state legislatures. 4. Establishes freedom of movement–anyone can pass freely between states, excluding "paupers, vagabonds, and fugitives from justice." All people are entitled to the rights established by the state into which he travels. If a crime is committed in one state and the perpetrator flees to another state, he will be extradited to and tried in the state in which the crime was committed. 5. Allocates one vote in the Congress of the Confederation (United States in Congress Assembled) to each state, which was entitled to a delegation of between two and seven members. Members of Congress were appointed by state legislatures; individuals could not serve more than three out of any six years. 6. Only the central government is allowed to conduct foreign relations and to declare war. No states may have navies or standing armies, or engage in war, without permission of Congress (although the state militias are encouraged). 7. When an army is raised for common defense, colonels and military ranks below colonel will be named by the state legislatures. 8. Expenditures by the United States will be paid by funds raised by state legislatures, and apportioned to the states based on the real property values of each. 9. Defines the powers of the central government: to declare war, to set weights and measures (including coins), and for Congress to serve as a final court for disputes between states. 10. Defines a Committee of the States to be a government when Congress is not in session. 11. Requires nine states to approve the admission of a new state into the confederacy; pre-approves Canada, if it applies for membership. 12. Reaffirms that the Confederation accepts war debt incurred by Congress before the Articles. 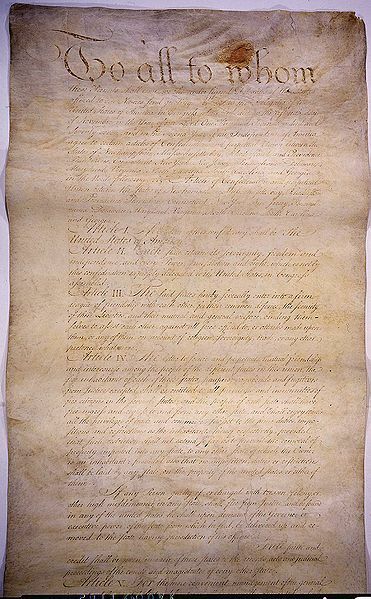 Before the Constitution....there was The Articles of Confederation — in effect, the first constitution of the United States. Drafted in 1777 by the same Continental Congress that passed the Declaration of Independence, the articles established a "firm league of friendship" between and among the 13 states. Created during the throes of the Revolutionary War, the Articles reflect the wariness by the states of a strong central government. Afraid that their individual needs would be ignored by a national government with too much power, and the abuses that often result from such power, the Articles purposely established a "constitution" that vested the largest share of power to the individual states. Under the Articles each of the states retained their "sovereignty, freedom and independence." Instead of setting up executive and judicial branches of government, there was a committee of delegates composed of representatives from each state. These individuals comprised the Congress, a national legislature called for by the Articles. The Congress was responsible for conducting foreign affairs, declaring war or peace, maintaining an army and navy and a variety of other lesser functions. But the Articles denied Congress the power to collect taxes, regulate interstate commerce and enforce laws. Eventually, these shortcomings would lead to the adoption of the U.S. Constitution. But during those years in which the 13 states were struggling to achieve their independent status, the Articles of Confederation stood them in good stead.